Friday was a bitterly cold day here in the Northwest, but we went to the park anyway because the rain symbol appeared on every day of the ten day weather forecast. 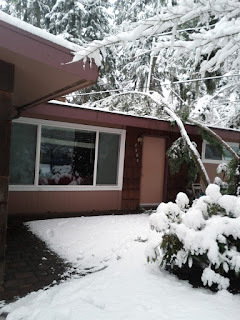 We were expecting to be holed up inside, with a few play dates and a lot of packing for our trip and our move. 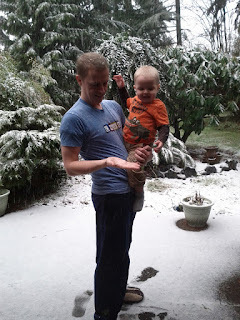 What we were not expecting was snow! We got a light dusting of snow on Saturday. 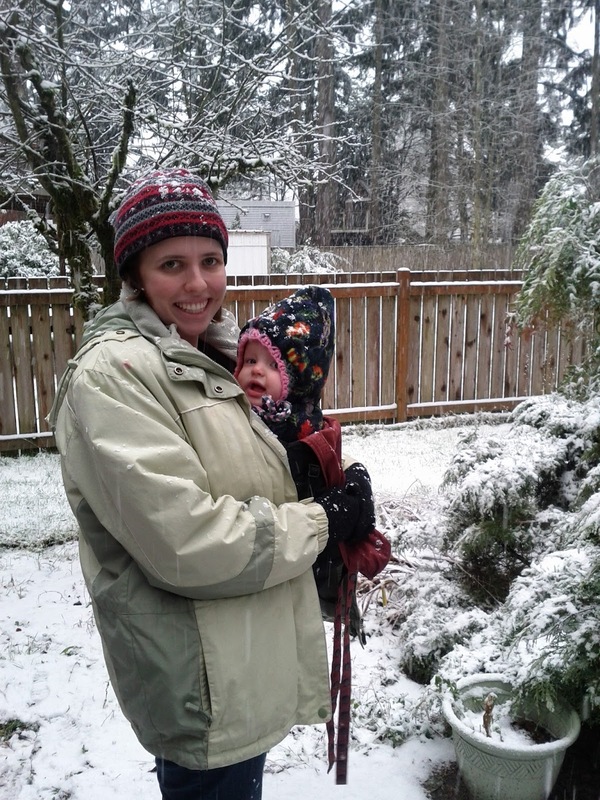 Eloise, upon seeing her first snow, was mildly interested. To be honest, I'm pretty sure she just came over to the window to be like Jared. And then she stayed at the window because it was delicious. Before you ask, no, she didn't pull herself up on the window, but she did try really hard for a couple of minutes before I helped her. Todd and Jared had basically the same reaction to this foreign white invader. They rushed outside without bothering to put coats or shoes on to feel it on their faces and catch it on their tongues. It was nap time, but when Jared said, "Go outside right NOW!" Todd said, "Okay!" We didn't know how long the snow would stay, so we all went outside to enjoy it. 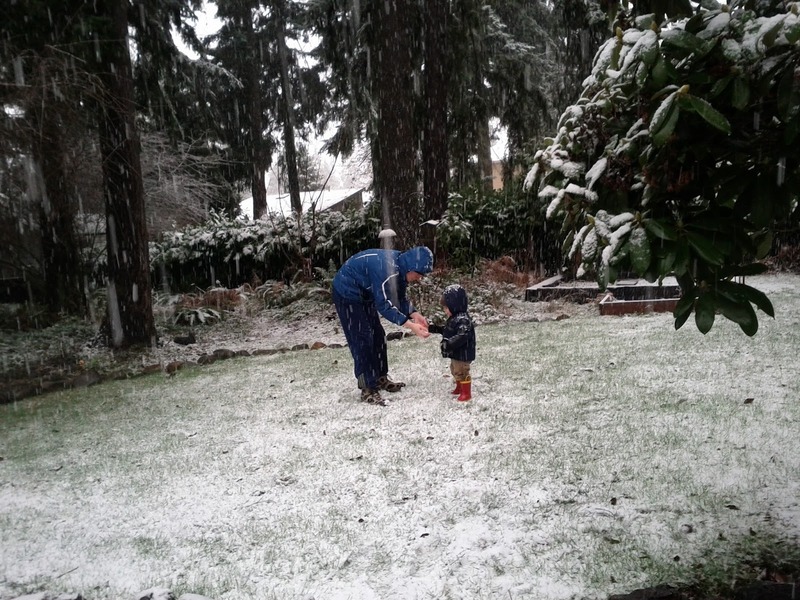 Todd taught Jared how to make a snowball, and they frolicked around like a couple of Californians in a snowstorm. 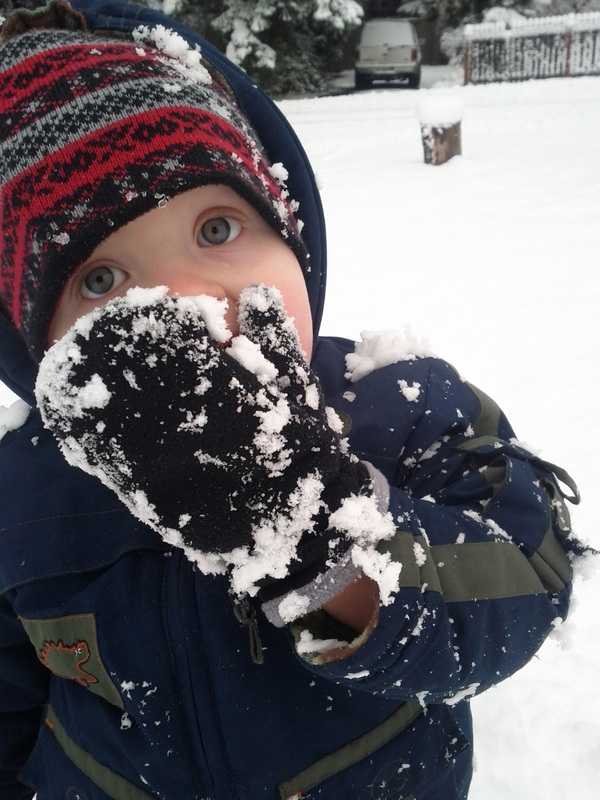 Eloise found the snow much more interesting when it was falling on her face. She thought it was fun for about ten minutes, and then she realized that she was pretty damp, and being zipped into mom's coat made it kind of hard to wiggle and play. 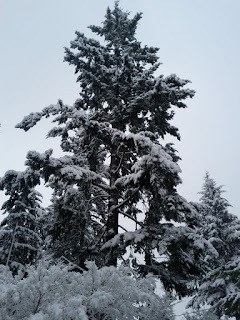 Imagine our surprise today when we woke up to find that the snow had continued to fall in the night. The snow started to fall heavily while we were in church. Since Kirkland doesn't have plows, a lot of church members left midway through the meetings because they were afraid that their streets would be impassable if the snow continued to fall. It did. 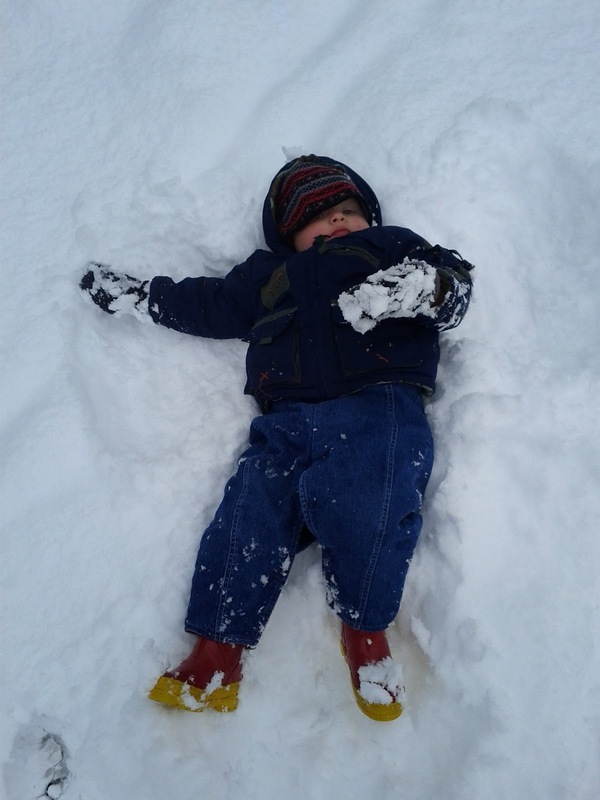 The snow was still piling up when we got home from church. Right after lunch, we heard a loud cracking sound and then a huge thud shook our house. One of the branches on the giant tree in our front yard (that we have been asking our management to have inspected and trimmed) had fallen on the house. The branch is at least 20 feet long. Later, while the kids were napping, the same thing happened again, in almost the same place. Here is our house now, with the two branches hanging in front of our front door. Right after the first branch fell on the house, our power went out when a different branch severed a power line across the street. 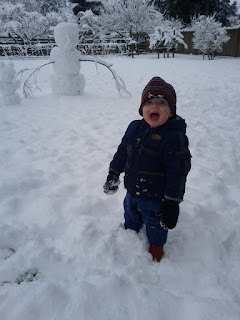 Having no power was not about to dampen one toddler's enthusiasm for snow. We weren't about to play in our yard though, with the tree raining twenty foot branches. We walked down the block to a vacant lot, where some neighbor children had built a snowman. 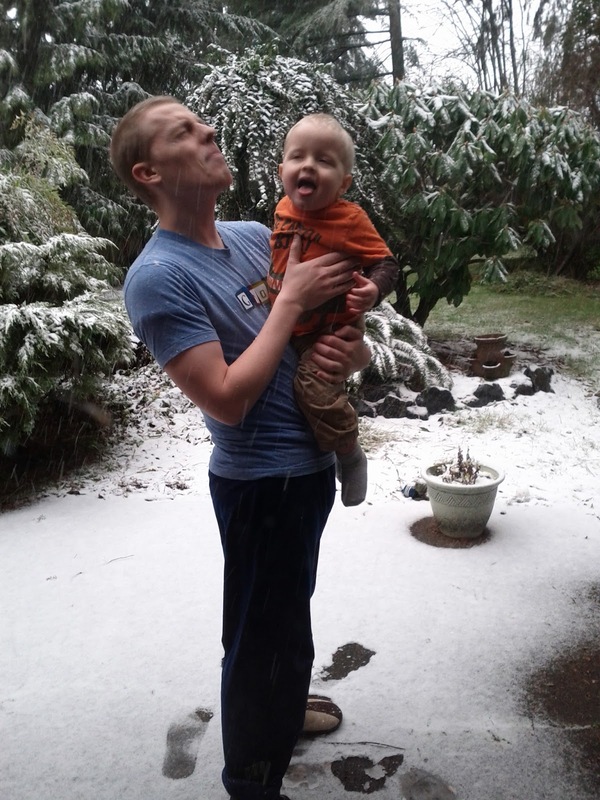 Jared was really excited to throw snow. . .
. . . eat snow. . .
. . . and make his first snow angel. He also loved wearing his fleece lined overalls and "big boy mittens." He wasn't too excited about walking in the snow, which went almost to his knees. We had been invited to dinner with some friends who weren't hit by the power outage, which was really convenient. We took advantage of their light and warm house to get Jared and Eloise in their pajamas before we came home, just in case, but we had power and heat when we got home. We didn't need to worry about missing our chance to play in the snow. 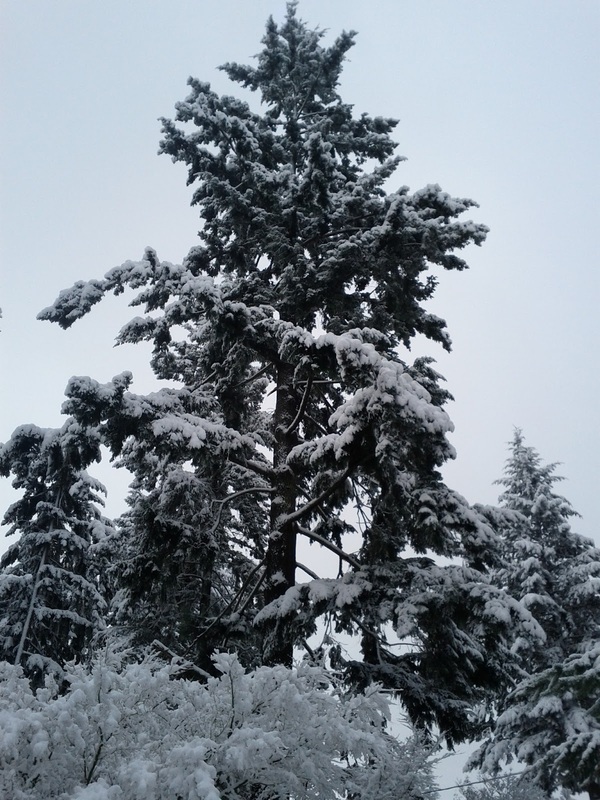 The forecast is more snowfall tonight and tomorrow. We will be holed up, drinking hot chocolate and reading piles and piles of story books until the roads thaw. Happy unexpected winter!